The HR series features four new top-of-the-line models with well-established form factor. 12 MP and 25 MP with choice of CoaXPress and Camera Link Full allows high resolution in combination with high frame rate. High frame rate is the nature of the latest CMOS technology. The latest CMOS sensors have multiple readout taps, pushing the demand for high-bandwidth interfaces. ON Semi CMOS 12 and 25 megapixel with maximum frame rate. The CoaXPress interface (CXP) meets the demands for higher transmission speed, with data rates up to 25 GBit/s (6.25GBit/s per coaxial line). Transmission of data, device control and power supply (up to 13 Watt) over the same coaxial cable. An addition to this, the well proven Camera Link Full inteface. Providing data rates of up to 5.44Gbit/s (680 MB/s). Both interfaces provide secure, loss-less video transmission for the High-End segment and require a matching frame grabber installed in the host PC. Integrating the global shutter CMOS sensors from ON Semiconductor, Python 25k and KAC12040, the HR series provides ideal solutions for inspection of high-definition displays, solar cells, surface quality inspection and 3D measurement. The HR25 boasts a resolution of 5120 x 5120 pixels at a 4.5 x 4.5 µm pitch (corresponds to 35 mm film format). Combined with the CXP interface, a stunning 80 frames/sec at full resolution is achievable. The Camera Link version is capable of 30 frames/sec. In comparison, the HR12040 provides 4000 x 3000 pixels resolution at a 4.7 x 4.7 µm pixel pitch (corresponds to 4/3“ format). The frame rate is 75 frames/sec with CPX interface and 65 frames/sec in the Camera Link version. 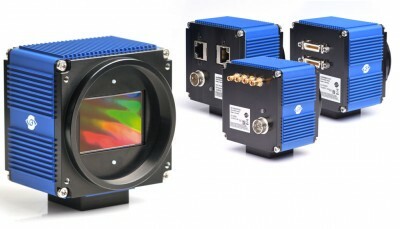 All models based on high-resolution CMOS sensors have the same set of features, such as fully scalable regions of interest (ROI). This reduces the amount of data to be transmitted, allowing tremendous increase in frame rate. The bit-depth can be selected to 8 or 10 bit, to match the application needs. Superbly precise synchronization with the host and simple integration in the inspection system using the application programming interface (SDK) is made possible by the wide array of control features available to the user.